On numerous occasions the hardreading staff has referred to a Boston Herald subscription as Biggest. Waste. Ever. Page 3 of today’s selfie local tabloid is entirely devoted to this piece bylined “Herald Staff,” the designation routinely employed in passing off press releases as actual news. The Boston Herald is now being printed in Providence, which means our loyal customers can look forward to a more reader-friendly paper. 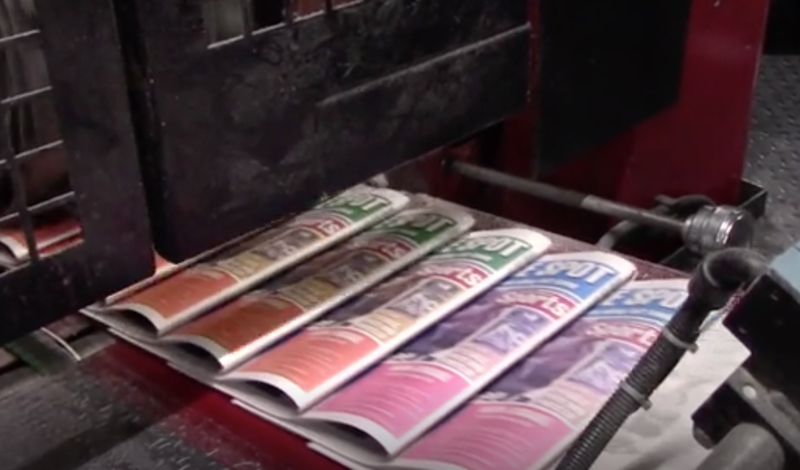 Beginning this week, the Herald is being printed at the The Providence Journal’s flexographic newspaper printing facility, which was North America’s first entirely flexographic printing facility when it opened in 1987. The Journal selected the flexo process because it creates a paper with vibrant color reproduction and uses an environmentally friendly, water-based ink that won’t have the paper rubbing off on your hands. 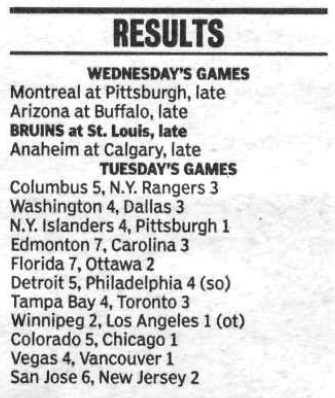 Here’s what this reader got on today’s Scoreboard pages. 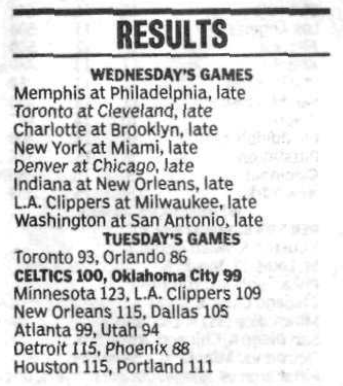 To be sure, the Herald at times gave readers the same short shrift when the Boston Globe printed it. Also to be sure, the e-Edition of the spotty local tabloid did have yesterday’s results. But we’re shelling out good money for the print edition while getting less news for the buck all the time. So, Heraldniks, we say this as you celebrate your new printing setup: Not a providential beginning. Not by a long shot.